All GENIUS branded products are warranted against defects in materials and workmanship for the expected usable life of the product. Any tool that fails to give satisfactory service due to defective materials or workmanship will, after inspection, be repaired or replaced free of charge with a new or reconditioned product, provided it is shipped prepaid to GENIUS Tools service center along with a copy of proof of purchase. At the discretion of GENIUS Tools, a refund may also be provided to customer in form of credit with an amount equal to the original purchase price. All claimed defective tools must be returned to the place of purchase. A copy of the invoice proving the date of purchase from the distributor will be required in the event of a warranty claim. The warranty period takes effect from the date of purchase and only extends to the original customer and cannot be transferred or assigned. Consumable products are warranted, at the time of sale only, against defects in workmanship or materials that prevent their use. Consumable products are goods reasonably expected to be used up or damaged during use. All Torque Wrenches (exclude torque calibration), Torque Multipliers, Torque Screwdrivers, and all Air Powered, Electric Powered & Battery Powered Tools are only parts warranted for a period of one year. Calibration and Tool Boxes are warranted for a period of 90 days. 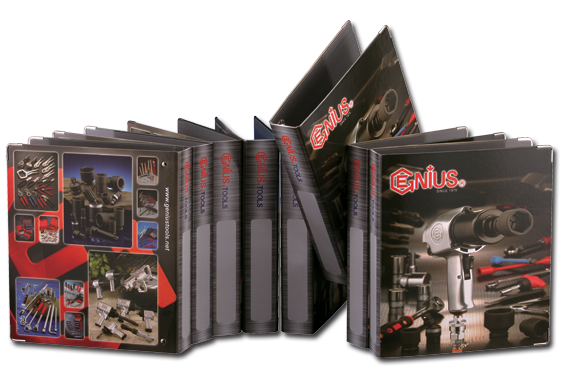 For regions where GENIUS Tools does not have its own service center, GENIUS Tools will supply 2% spare parts free of charge to the distributor for repair and maintenance. 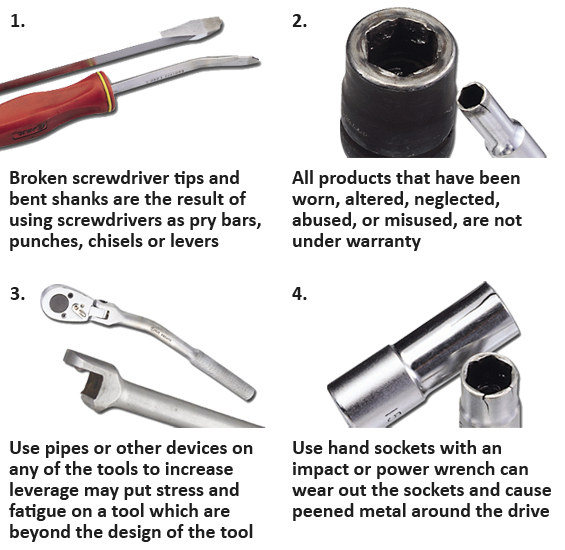 Moving parts of Ratchets, Hinge Handles, Speed Handles, Sliding T-handles, Impact Drivers, Adjustable Wrenches, Pipe Wrenches, Gear Wrenches, Pullers& Riveters are warranted against defects in material and workmanship for the life of the product. This warranty is limited to the repair and replacement, without charge, of said moving parts and is not valid on any irreparable damage sustained on the main bodies of these tools. This warranty does not cover damage attributable to normal wear and tear. Warranty does not cover associated shipping and handling costs. Warranty will be voided if the damage has occurred due to abuse, misuse, neglect, alteration, lack of maintenance or wear and tear. 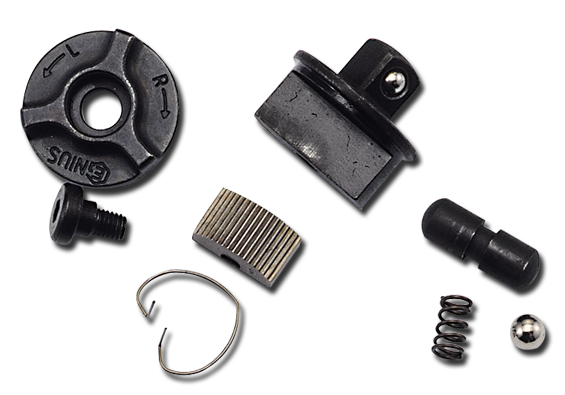 Upon inspection and approval, GENIUS Tools, at its option, will repair or replace any defective parts and charge parts and labor costs. GENIUS Tools will also charge shipping and labor costs if the returned product requires regular maintenance only. GENIUS Tools products used on assembly process have a limited 60-Day warranty, from the date of purchase, against defects in material and workmanship. Due to the nature of the product, the following products are not covered by any warranty: Reducing Adapters, Thin Wall Sockets, Swivel/Universal Sockets, Stud Bolt Sockets, Universal Joints, Wobble Extension Bars, , Flexible Wrenches, Cutting Tools, Extractors, Files, Picks, Punches, Chisels, Spanner Bits, Magnetics, Batteries, wood/plastic/rubber-made materials, items that are 6.35mm in size and under and discontinued items. For more information on discontinued items, please see Return & Exchange Policy section. GENIUS Tools does not provide warranty for products labeled other than GENIUS.
. No warranty consideration can be made if the initial inspection shows that the tool has been abused, misused, neglected, altered, improperly maintained or worn out from use. Broken handles, bent shafts, snipe or hammer marks also void warranty. Figure 1, 2, 3, 4 and as such are not covered by any warranty. Consumable products are goods reasonably expected to be used up or damaged during use. GENIUS Tools will not accept any liability for incidental or consequential losses to the customer incurred by the purchaser losing the use of one or more of our products. GENIUS Tools is not responsible for any damage or personal injury that may result from the misuse, alteration, abuse, or use beyond the expected life of its products, or using tools which have been improperly repaired or maintained. GENIUS Tools reserves the right to make changes in design, appearance or construction of all products at any time without incurring any obligation in making such changes in products previously distributed. GENIUS Tools also reserves the right to discontinue the availability of any products at such time GENIUS Tools considers necessary. Features, dimensions, descriptions and images of products in the brochures, catalogue and online catalogue are subject to change without notice. Unless otherwise stated, shipping costs will be charged for shipments to a customer’s location. Any additional charges incurred for services, such as customer’s carrier or special handling by the carrier, must be paid by the consignee. All backorders will be shipped at customer’s expense. Loss or damage that occurs during shipping by a carrier selected by customer is customer’s responsibility. Loss or damage that occurs during shipping by a carrier selected by GENIUS Tools is GENIUS Tools’ responsibility. GENIUS Tools agrees to pay one-way return shipping costs only on product that has been approved for warranty work, or exchange. This condition will be voided if the returned product appears to have been abused, misused, neglected, altered, badly worn, or treated with lack of maintenance. If you have received an incorrect product, ordered the wrong item or you are not fully satisfied with our product, you may return the product, prepaid, for a refund or an exchange only if the product has not been used with and is in its original condition and packaging. If the product is no longer in its original packaging, it cannot be returned unless the product is defective. To receive a refund or exchange please contact us by phone or e-mail and indicate the reason you would like to return the product. We will then issue an RA# (Return Authorization Number) and absolutely no items without an RA# may be returned. Any items without an RA# will not be accepted at our warehouse. Customer will be responsible for shipping costs for the returns except in the case of the incorrect product being shipped by GENIUS Tools, or in the case of a damaged or defective product. Once we receive the product we will ship a replacement product back to customer free of charge. All returns and exchanges should be within 30 days from the date of purchase in its original condition and packaging. There will be a 20% restocking fee on all returned or exchanged item(s). An original receipt is required for all returns, exchanges and warranty repair services. If, however, the product has been used and you are not fully satisfied with it, you may return or exchange the product within 7 days from the date of purchase along with a copy of proof of purchase. When a warranty product is discontinued or no replacement is available, GENIUS Tools will offer a credit for the value of discontinued product at the time of sale. An original receipt is required. Any cancellation must be approved by GENIUS Tools, and may be subject to restocking fee and other charges. GENIUS Tools shall not be held liable for any damage as a result of any delay or failure to deliver product due to causes of Acts of God, government regulation, strike, inability to procure product, supplies or raw materials, delay in transportation or any other circumstances or cause beyond reasonable control of GENIUS Tools. In the event of such delay, the date of delivery shall be extended for a period equal to the length of delay.